Oh no, here we go again. 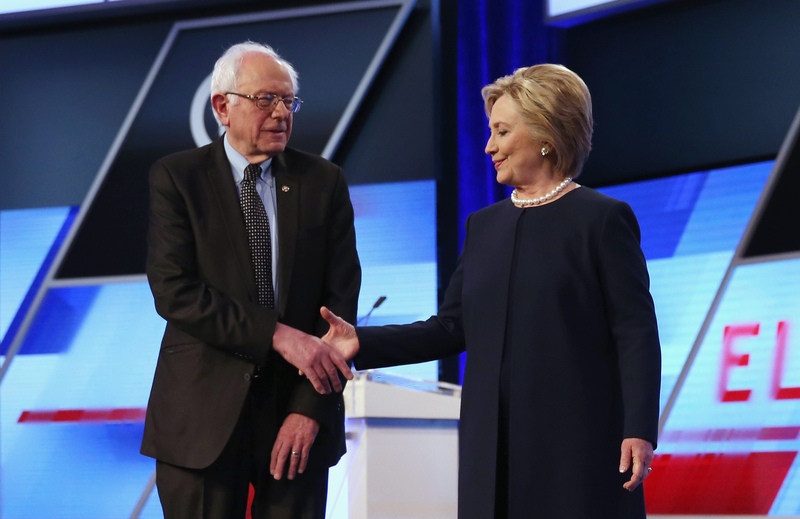 What color is Bernie Sanders' suit at Wednesday's Democratic debate? Is it black or is it brown? Also, is that the most important question of the night? You probably thought #TheDress would remain in the social media hall of fame where it belongs, but the issue had been resurrected on Wednesday when Vermont Sen. Sanders showed up to the Democratic debate in Miami wearing an ambiguously colored suit. To some, the suit liked black. To others, it looked brown. According to a member of Sanders' campaign, who tweeted during the debate, the suit was actually blue. In reality, the visual conundrum probably had to do with the lighting on stage — although that rationale begs the question of why former Secretary of State Hillary Clinton was spared of the wardrobe controversy. No matter what color his suit actually was, the black/blue/brown debate may have become more important to viewers and social media users than the one happening between the candidates. It was certainly the sillier of the two. Sanders and Clinton dueled it out on stage with a particular focus on immigration in front of a largely Hispanic audience and moderating team. It was the question that everyone watching at home wanted answered on Wednesday night. If only the moderators had been able to check Twitter during a commercial break. The great color debate of Wednesday's Democratic showdown could have made for a lighthearted interjection among the hard-hitting questions about real issues.